FROM THE BESTSELLING AUTHOR OF LIZZIE'S SECRET and LIZZIE'S WAR. LONDON 1958. 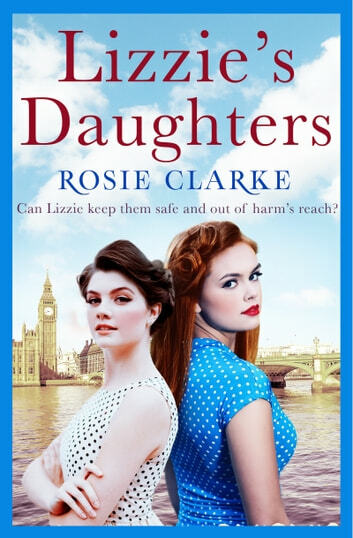 Lizzie Larch battles to keep her daughters safe and out of harm's reach. Perfect for the fans of Nadine Dorries and Lyn Andrews. Lizzie adores her beautiful and clever daughters and will do anything for them. Both possess a wonderful creative flair, but have fiercely different characters. Betty, the eldest, is head strong like Lizzie's first husband whilst Francie is talented and easily influenced. When Betty runs away after an argument with Sebastian, heartbreak and worry descend on the family. At great risk to her health, Lizzie finds herself pregnant but is determined to give Sebastian the son they craved. Sebastian meanwhile is plunged into a dangerous overseas mission using his old contacts to track Betty to Paris and to the lair of the rogue that seduced her. Consumed with guilt, can Sebastian right the wrongs of the past and finally unite his family and friends? Excellent, an exciting book, well written. I wondered if there could be another book in this series. Jack could possibly be the baddy! A good ending to the saga with new storylines introduced making it a exciting book to read. A great page turner and hard to put down. Interesting story about the ongoing difficulties for migrants after the war. How after all the years their suffering doesnt go away. Just found this a bit over simplistic. I like feel good stories but this seemed intensely so. I'm sure those teenage daughters would have been harder to handle than this story!! Everyone was just too perfect.